New For Patrons: The Definitive Guide to Marvel’s Legion, David Haller – The Son of Xavier! David Haller is a son that Professor Charles Xavier never knew he had until his introduction in New Mutants #26-28 – and neither did we! Haller is the product of Xavier’s brief (and somewhat unethical) affair with his patient and eventual colleague Gabrielle Haller, a noted attorney (and, later, an ambassador). When the Haller family becomes the target of terrorism, David unconsciously defends himself with his prodigious mutant powers. David’s survival comes with a steep cost – his psyche becomes fractured by a post-traumatic dissociative disorder and his nascent powers are shattered along with it. [Read more…] about New For Patrons: The Definitive Guide to Marvel’s Legion, David Haller – The Son of Xavier! It’s the second episode of our entirely out-of-order dive into my 50-year collection of X-Men comics, and today we’re leaping to a character who has become a multi-media sensation in the past year: David Haller – Legion. Legion’s debut in New Mutants (1983) #26-28 is a brief arc filled with thematic content that still resonates strongly in the modern day. See the Guide to New Mutants & Young X-Men for collection information. Is the David Haller of this story recognizable to viewers of FX’s Legion? Do these comics still hold up today? And, does Claremont leave the series doing right by his cast of indomitable-willed woman? Watch this mega-sized episode and find out! The Pull List: Action Comics, Avengers, Calexit, Detective Comics, Jim Henson’s Labyrinth, The Terrifics, Thanos, & more! 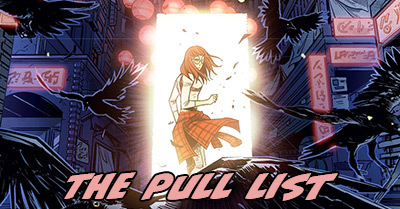 This week The Pull List is holding steady at a still-staggering 32 comic books. I’m not sure if I was being a moody reader or if every company shipped some bunk books this week, but the average rating for the week was 2.70 – a full third of a point lower than the past few weeks. While that means most of the books were still better than average, it’s not by a whole lot. Artwork from Thanos #16, line art by Geoff Shaw with color art by Antonio Fabela. A great-looking, contemplative issue that brings together the members of the Bat-Family we don’t usually see in this book – Nightwing, Batgirl, Red Hood, and Damian. 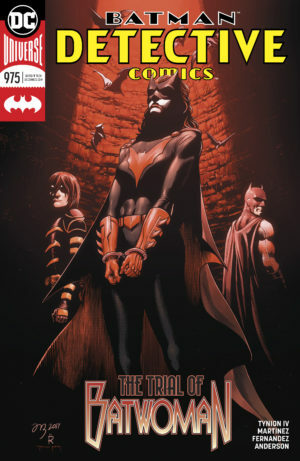 Batman has pulled these trusted lieutenants together as an inner council to decide Batwoman’s fate as a member of the Bat-family, yet in some ways their conversation is also a litigation of Bruce and his methods as the head of this dysfunctional household. Meanwhile, Batwoman holds herself accountable for her own actions, with a surprising result. This isn’t an issue that’s going to appeal to a more casual reader – it looks amazing, but it has hardly any conflict. However, for someone who has been reading from the start this pierces right to the heart of this title and the ideological divide between Batwoman and Batman that has been brewing all along. Part of what makes it so power is that Batwoman also has an avowed “no kills” philosophy, but she is willing to make exceptions when other lives hang in the balance. Batman won’t make exceptions, so he gets to watches thousands of Gothamites die from his moral high ground. It’s heartbreaking to think of this book writing by someone other than Tynion or with a cast other than this one. Everything about it works so incredibly well. Yet, we’re in the “disassembled” phase, and there’s certainly more conflict to come before Tynion moves on. 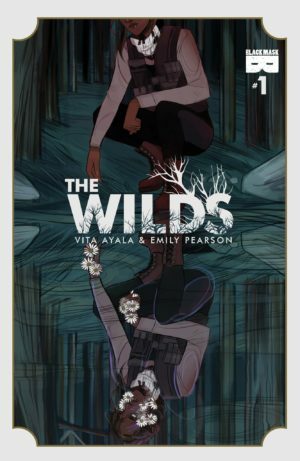 A strong and sombre new zombie comic, The Wilds is definitely a descendent of Walking Dead but with a completely different tone – due in no small part to its pair of woman creators, Vita Ayala and Emily Pearson. We get the same old zombie-pocked landscape with isolated camps trading resources and doing their best to survive, except the zombies are walking plant life – humans who have turned into semi-sentient flower pots. It makes for strangely calming, beautiful zombies to see all of their typical goriest bits covered in blooming flowers. Pearson’s art evokes such masters of the modern form as Allred and Noto, employing their same plain, truthful faces and uncomplicated backgrounds. Beneath the flowery dressing, this is the familiar story of a single senior errand runner who thinks it might be time to get out of the game, and how an act of compassion on her last journey might spell the end of the safety of her heavily fortified compound. There’s no slam bang action beats in this one, but the strange stillness of it is pulling me towards reading more. [Read more…] about The Pull List: Action Comics, Avengers, Calexit, Detective Comics, Jim Henson’s Labyrinth, The Terrifics, Thanos, & more! 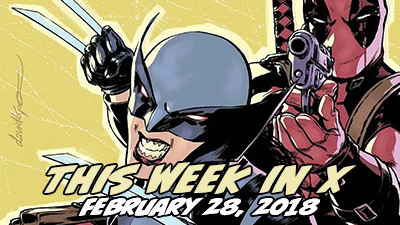 It’s the ninth week of new comics in 2018, and This Week in X we have an unusually light week of X-Men. There are just three new titles and three collections to cover, although one of those collections is a really big deal to me! All-New Wolverine (2016) #31 is a fun-filled one-off team-up of Honey Badger and Deadpool. 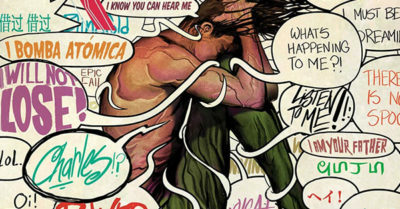 Legion (2018) #2 is a comic book that does not star Legion nor appeal to his fans from any medium. X-Men: Blue (2017) #22 finds some character moments in this symbiote space saga, but skimps on details. Learn more about how each of those series reached their current issues and hear which ones I’d recommend picking up. Plus, learn what new X-collections are out this week, including Legion – Son of X, New Mutants, and Weapon X! The Pull List: Avengers: No Surrender, Backways, Detective Comics, Maestros, Marvel 2-in-One, & more! The Pull List has grown a lot longer this week – 17 issues in all! That’s due to catching up with another Marvel book (Thanos), several new indie #1s, and a few Image books I’ve read to the present in the past few weeks. Also, starting this week I’m running very short reviews of the X-Men books covered in This Week in X here, so that you can catch up on all the week’s new titles in one place! 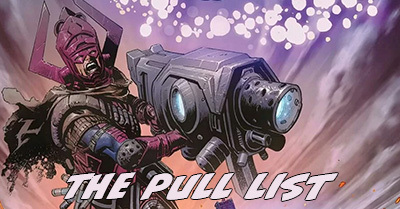 I hope these capsule reviews can help you decided what series you should add to your own pull list, or at least catch up with once they hit collected editions! And, remember, this feature is still new and evolving, so your comments and suggestions count a lot! [Read more…] about The Pull List: Avengers: No Surrender, Backways, Detective Comics, Maestros, Marvel 2-in-One, & more!